Try Keto Krate snack subscription service for 5-8 great low carb sugar-free snacks delivered to your door every month. Check out this Keto Krate February Review and products. Subscribe to Keto Krate and receive 6-8 low carb keto approved snacks (& $20 of discount codes) delivered right to your door. The products range from savory or sweet snacks, protein bars, breakfast items, drinks, dressings, flavorings and sweet treats. None of the products contain maltitol – your blood sugar and tummy will thank you for that one! Keto Krate procures the best low carb keto snacks and delivers them to your front door. This supports start-up and small business by spreading the word of new products. I like that. If you are a bonafied new product junkie or are searching for new keto snacks, then this is for you! It’s a great way to sample new low carb and keto products. Keto Krate is the perfect gift for those people in your life who are hard to buy for – we all have someone like that in our families, right? 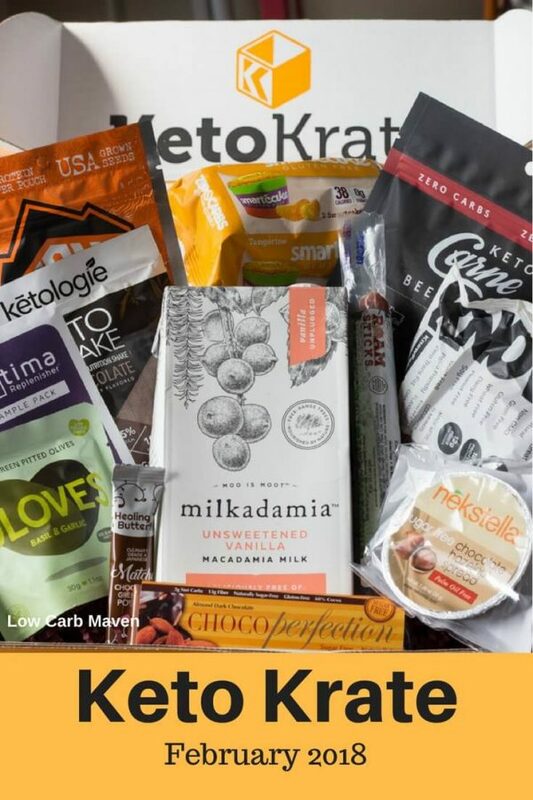 I was surprised with 11 GREAT KETO PRODUCTS in February’s Krate. Yes, eleven! It took me two weeks to try them all. 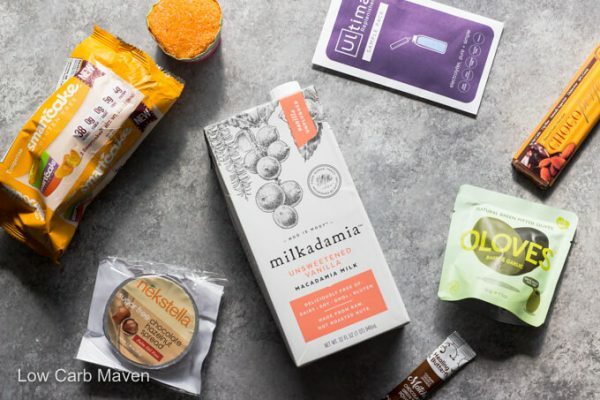 Here are my thoughts…..
Milkadamia Unsweetened Vanilla Macadamia Milk – My kids and I loved this. I’m a big almond milk fan but really liked this product which I used with the Ketologie shake and also drank on its own as a mid day snack. Two thumbs up. Chocoperfection Dark Chocolate Almond Bar – I have been a fan of Chocoperfection for many years. They have some of the best tasting chocolate with a beautiful silky mouth-feel. It’s expensive, so I indulge a square at a time. They have many flavors available. My favorite is raspberry. Ketologie Chocolate Keto Shake – I enjoyed this shake with a serving of Milkadamia. I threw it in the blender with some ice. It tasted pretty good. I did feel a little jittery after consuming and I think it was the powdered coconut oil. It cranked my brain up a notch! Know Foods Cinnamon Cookie – These are super filling and satisfying cookies with a dense-chewy cake consistency. They taste great. I could only eat 1/3 at a time! Skout Backcountry Spicy Texas Chili Pumpkin Seeds – I LOVE Skout pumpkin seeds! They come in great flavors and are the perfect addition to salads or just for snacking. Smartcake Tangerine – Smartcake has outrageously good cupcakes. They come 2 to a package. These were good, but a bit strong in flavor for my tastes. My kids went nuts for them! Nekstella Chocolate Hazelnut Spread – Best chocolate hazelnut spread ever! I love sugar-free hazelnut spreads and Keto Krate has sent some great ones, but they all had the cooling effect from erythritol. This did not. Softer in texture, the individual portion cup was more of a dip than a spread. I loved it. Roam Sticks Hickory Smoked Pork with Uncured Bacon – I’m always excited to get Roam Sticks. I love them all. I save these for my son because he smiles every time he eats one. I Love Snacking Oloves – Basil & Garlic – I am so glad that my kids don’t like olives because these olives are great! Olives make a great keto snack and I love the flavor combination from Oloves. They have other keto snacks, too. Healing Butterfly Chocolate Matcha Tea – I’m not a big tea drinker, but I would drink this on occasion. It was very good. Keto Carne Original Beef Jerky – I’m a BIG jerky fan. 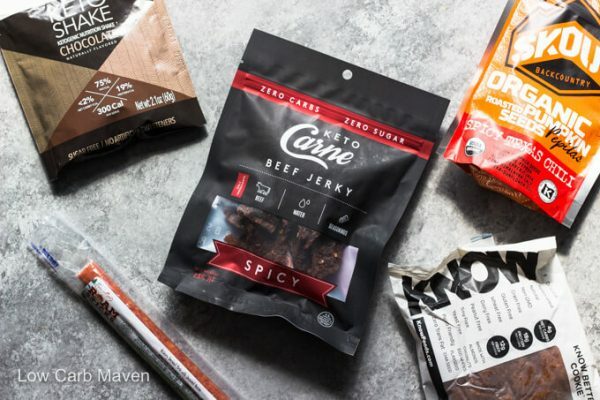 Keto Carne offers zero carb jerky in great flavors. It is a little on the hard side, but it provides great proprioception for the jaw which tells the brain you are working hard and eating and this makes you fuller faster. But, I just like how it tastes. sign up in the side bar or click the words “Keto Krate” above. HI Kim. Love your site. Do you have a cookbook? I just got my second Keto Krate. Loving it! I will keep the subscription going.